Ah, the tropics! 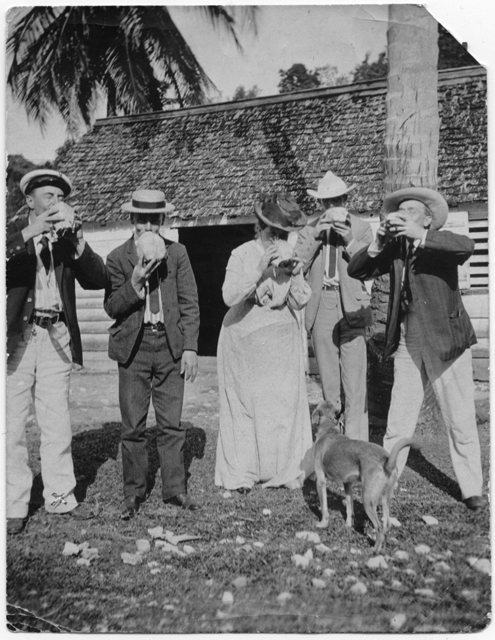 Here Henry M. Jones, author of Ships of Kingston standing at the far left, and four unidentified friends enjoy a refreshing treat under the palms. The woman may be Henry’s wife Abby Bosworth Holmes Jones, though between the hat and the coconut, it’s difficult to tell. The dog is also anonymous. From the always entertaining Joseph Finney Collection. 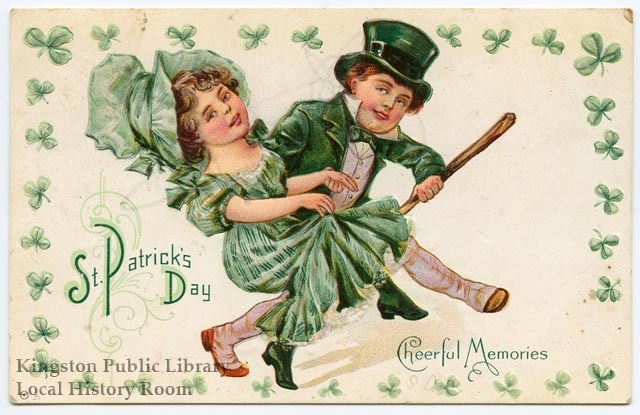 A rosy-cheeked couple merrily skip along, both dressed in green. She wears a large bonnet, a green empire-waisted gown and dainty black boots. He sports a traditional leprechaun outfit with a green jacket, bow tie and top hat, accessorized with a walking stick and high spats.